Standing in front of the colorful windows of Palais des congres de Montreal in Place Jean-Paul-Riopelle in the Quartier International in city of Montreal, Quebec, is the sculpture/fountain known as La Joute. The newly designed square is the ideal location for the sculpture which is set in a fountain encircled by a timed ring of fire. Created by sculptor Jean-Paul Riopelle, the sculptures are made of bronze with a central fountain which is surrounded by abstract animal and human figures. The fountain runs on a kinetic sequence which takes approximately 32 minutes beginning just before each half hour. 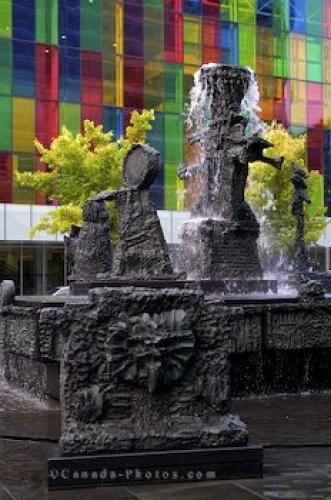 Picture of the La Joute sculpture/fountain in Place Jean-Paul-Riopelle in Montreal, Quebec. ... The fountain slows down, a natural gas shoots through the water which creates the ring of fire around the sculptures continuing for about 7 minutes. The entire process starts again and happens every hour throughout the day in the summer at Place Jean-Paul-Riopelle. This park where the La Joute sculpture stands was named after the artist, Jean-Paul Riopelle and is open to the public where people can sit and relax amongst the trees watching the fountain in action. During the evening hours, this park becomes a magical place when the fire is illuminated around the sculpture. Sculpture fountain, La Joute in Place Jean-Paul-Riopelle, backdropped by the coloured windows of Palais des congres de Montreal, Montreal Convention Centre, Quartier International, Montreal, Quebec, Canada.